Photo challenge: you might want to experiment with movement or transportation in a different way. Camels caravan, on the move for a very long journey through the desert, carrying salt tiles from the salt flats in the Danakil depression – Hamed Ela, Ethiopian Danakil. Nice composition ! The personage of the foreground has a perfect attitude. Thank you so much, Ha! Ciao Stefano….che bello questa foto! I’ve been lucky because the caravan was heading, slowly of course, straight to the site where I was shooting the salt diggers, so I had all the time to think about and prepare different compositions. Stefano, the perspecitve and sparentess of the background on this are just perfect. Oh, my gosh. I love the perspective in this photo! Not just the content — which is outstanding — but your take on how to get the right perspective! Wow! Thanks, Rusha. I took some different composition and this is my preferred one. That is one superb photo, Stefano! Thank you so much, Lynn. 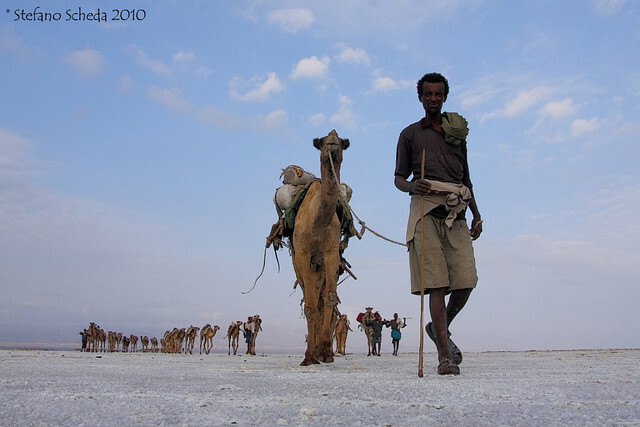 You find outstanding subjects in the Danakil region. What a dramatic wonderful photo. I’m so glad I’ve found your blog again. Wow! Wonderful! I love the angle and composition! Magnificent! Stefano, I have only one thing to say. you make me feel inadequate!! Ha una profondità pazzesca ! Sì, è incredibile, l’aria è pulitissima e cose molto distanti sembrano a pochi passi. How lucky you were to see this caravan coming towards you… but then you captured it in a really original and beautiful way! Stunning photo! Thank you so much, Noortje!